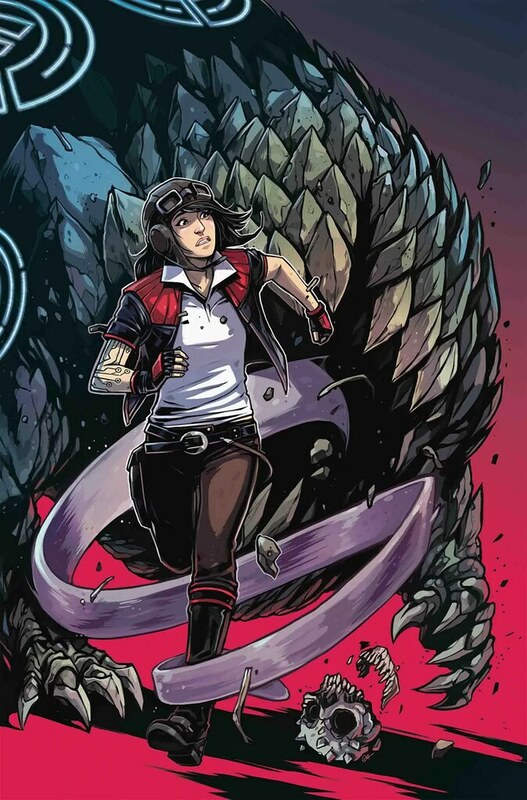 Doctor Aphra Annual #2 doesn’t star Aphra, but it does feature her in a key role. Instead, Winloss and Nokk are the heroes of this issue as they’re hired by Aphra to hunt and capture the Shadowfang Beast, a creature from the Hundred Years Darkness. It’s leads to a fun adventure. First off, Si Spurrier nails the writing on this one with the two new characters. Winloss and Nokk are a lot of fun. One is a human, and one is a Trandoshan, and they’re a couple who specialize in hunting down exotic beasts. Each of them is unique and colorful. In just one issue, he develops them enough to make them the kind of characters you’d love to see again. Honestly, I’d rather see a Winloss and Nokk series than another Luke, Leia, Han or Lando series. We get so few stories starring original characters that when someone creates a good one, it makes you realize just how few we have. Regardless, in this issue they explore a treacherous tomb and hunt a deadly monster. Along the way, Aphra remotely guides them through the maze of deadly traps, and Winloss and Nokk bicker amongst each other and with Aphra. There’s humor, action, and an entertaining story. Caspar does a great job with the artwork bringing the environment and the characters to life. There’s nice attention to detail, great coloring and lighting, and I like the art style. Bottom line – this issue was awesome. I’d love to see this creative team do some more comics, especially with Winloss and Nokk. Whether you’re an Aphra fan or not, this is an issue you can check out and enjoy as it’s a very standalone story. I give it a five out of five metal bikinis.